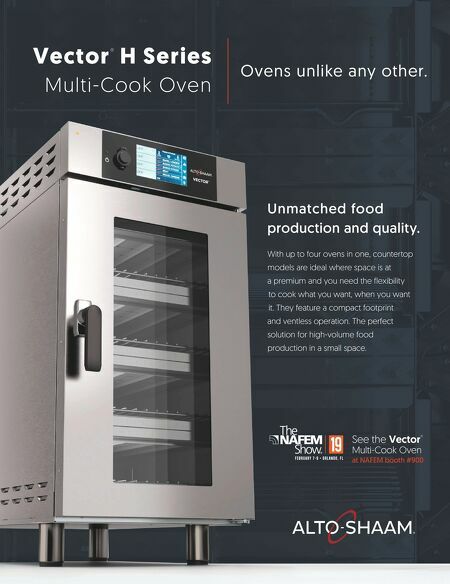 See the Vector ® Multi-Cook Oven at NAFEM booth #900 Ovens unlike any other. Ve c t o r ® H S e r i e s Multi-Cook Oven With up to four ovens in one, countertop models are ideal where space is at a premium and you need the flexibility to cook what you want, when you want it. They feature a compact footprint and ventless operation. The perfect solution for high-volume food production in a small space. Unmatched food production and quality.